Thus far, my competition experience with revolvers includes IDPA (International Defensive Pistol Association) and Steel Challenge. 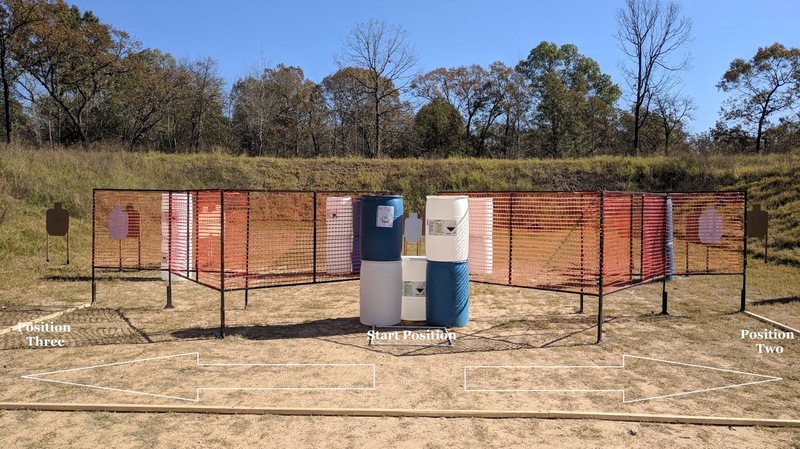 I have enjoyed shooting wheel guns in both formats, but when I found out our local club was planning to offer USPSA (United States Practical Shooting Association) matches on the fourth Saturday of each month, I was pretty excited. From the outside looking in, USPSA appears to use specialized racing equipment compared to the holsters and speed loader/moon clip holders of IDPA I am used to using. Sorry this is a little small. 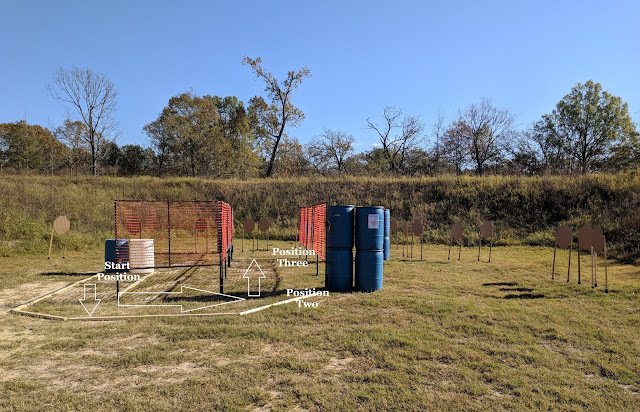 This was what I used at my first USPSA match in October 2017. My choice to shoot in open was the only choice for an optic equipped revolver like my Smith & Wesson Model 66 Carry Optics. Why not shoot in Carry Optics? Unfortunately, USPSA's Carry Optics Division caters only to handguns with slide mounted optics. Instead, I would be shooting against the double stack 2011 race guns. Although I love new gear, I didn't want to purchase a bunch of new stuff if it turned out USPSA wasn't for me. Instead, I used the kydex holster, pouches, and speed loaders that I use in IDPA. The only difference is an Uncle Mike's double belt system my fiance ordered me for this match. The outer/inner belt system is a great idea and I wish IDPA would permit it for the convenience. Now, on to the stages! The blue and white barrel were not involved. This was actually the second stage our squad shot at the match. The start position box was just outside of the shooting area, so you had to step in to the box as you drew. Rather than shooting the center array right off the bat, I decided to move to Position Two and shoot the first array of three. Everything went fine until shot five which was a click instead of a bang. A bang followed by five more clicks threw my stage plan out the window. So I did a reload, fired two quick shots then continued to load midway through each array. Up to this point, I've never experience a failure with this revolver. I was actually surprised when it happened twice. I thought it might just have been the round. Until it happened again, just a few steps away, at Position Four. I finished. It wasn't great. My squad suggested an extended firing pin. This stage opened with two targets directly in front of the start position. I always like to load on the move, so I took three quick shots on both targets then moved to the right toward Position Two. I got another click at this position, but that round went off on the second go round. A turn followed by a quick reload and I got the chance to do some shooting through a port. I reloaded on the move across the stage to Position Three and had another light strike. Luckily, the round went off on the second attempt. One last port to shoot through and the stage was over. Four light strikes in two stages is a lot. Thankfully, I didn't have any more that day. Table starts can go great or terrible. I haven't done a lot of table starts. Every once and a while the MD of our IDPA matches will throw one in for fun. Well, this was a table start off one of those barrels. I figured I could get this stage done with three speed loaders considering there were eight targets. So empty gun on the table with the cylinder unlatched. The buzzer rings and I grab a loader with each hand and stow them in the pouches. I then grab the revolver and promptly drop my final loader in the dirt. I retrieved the loader and put three on the first target and three on the far target. No hits on the non threat. 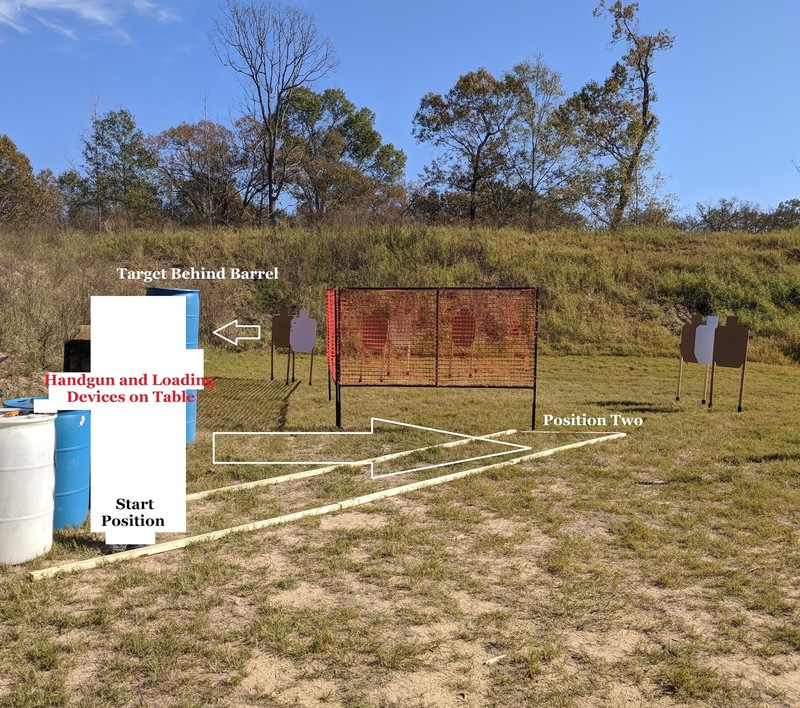 A quick reload and two shots on the target behind the barrel, before engaging the two at the end of the shooting area while advancing. A final reload and two on each paper target. Aside from dropping the loader at the start position, this stage went fine. Standards are some of my favorite stages. The standards stage was the last stop for our squad. Most of the shooters chose to start in the left box and move right, but I prefer to move right to left. This allows for a faster and safer strong hand reload. This stage required two on each target of the right array, a decent reload on the move, and two more on each target. A reload was not required in the stage description if a shooter's handgun matched or exceeded capacity to finish without it. Even though my reload was relatively smooth, it was still slow compared to the magazine fed guns. Our squad started on this stage. I was excited to get right into running and gunning. This stage featured five arrays of three targets, each target required two hits. 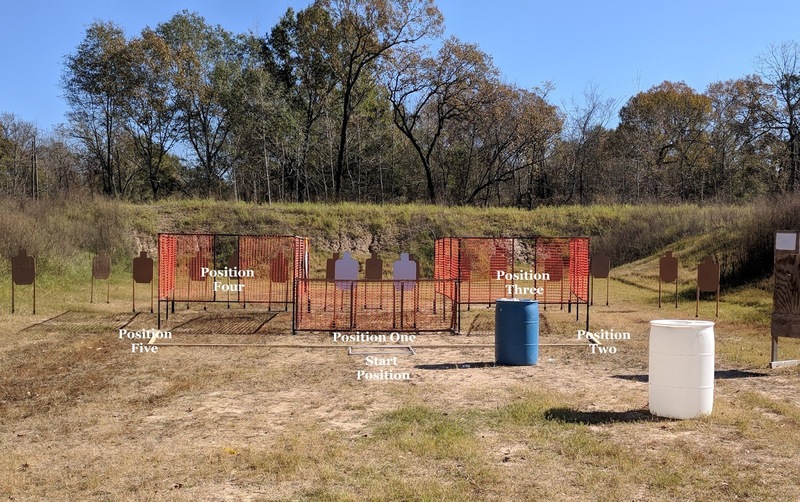 Many of the shooters chose to shoot the first array on the retreat. I took the shots from the start position then retreated while performing a weak hand reload. At Position Two, I engaged the second array then reloaded on the move to shoot the third array through the port. Looking back, I should have engaged the fourth array on the way to the port. This would have prevented the standing reload at Position Three. Two more reloads and two more arrays to engage. This was a fun stage! I tried to shoot a bit faster this match. I shot consistently with my last match performance. My hits amounted to 110 As, 1 B, and 5 Cs. I was the most accurate at this match as well. IDPA has taught me not to shoot make up shots due to both limited capacity of the cylinder and the limited ammo on my belt. I may have to learn to take make up shots, but only if I get a new revolver to shoot 8-Shot Minor. This was a great USPSA match despite my revolver issues! I ended up 28th out of 36 shooters. I'm not quite sure if that is an improvement or not. These two matches actually make me wonder if shooting revolvers against magazine fed pistols is worth it. I find it challenging which is why I keep at it, but not everyone just likes to play. Almost everyone likes to win. 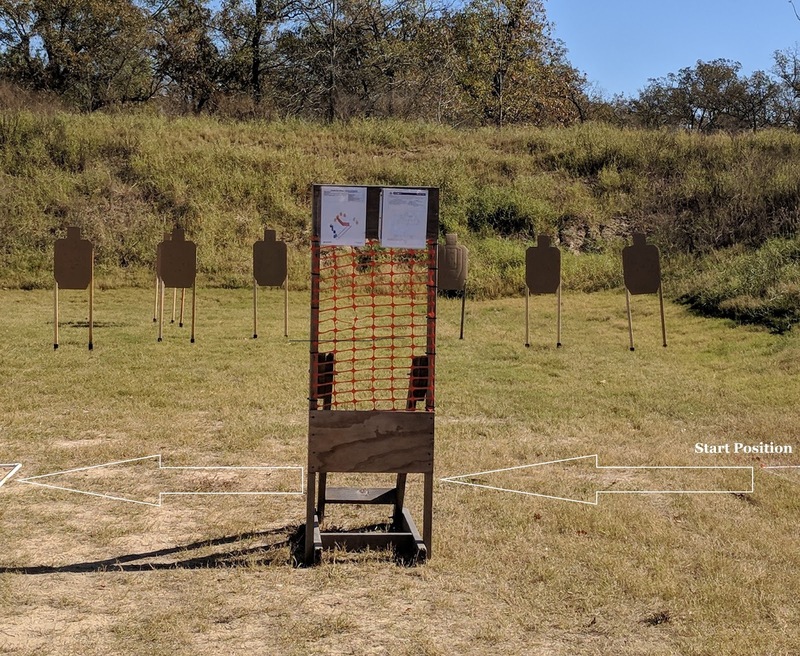 Unless you are Jerry Miculek, I'm not sure a wheel gunner can compete with some of today's race guns, but that doesn't mean I won't keep trying. Do you think revolvers are outgunned at matches today? Thanks for the comment! I have been interested in ICORE for a long time but there are not matches in my area. I've only found two clubs in Texas down by Houston which is about a three hour drive. I plan on heading down there for a match in Spring 2018. Start your own ICORE club! We just started ours in Prado (Chino, CA) and the process is painless. We need more ICORE clubs! I'm starting to see more and more wheel guns on the range, and not just the senior crowd. Several youth and shooters I would expect to see in SSP/ESP or Production cutting over to REVO. I've actually asked on our group page if anyone would be interested in an ICORE club. I got four Maybe's and twenty No's. I've been shooting atypical revolvers, like the 66 and the Rhino, to generate interest and I may have one or two slowly changing their minds. We'll see! The way I got people interested and converted was the drug dealer model. Have a few rigs set up for revolver, and let them run the gun, they provide the ammo. Got a lot of interest once shooters saw the challenge and how fun it was. It's well worth the effort. I shoot a S&W 686plus, and that holster is just what I’ve been looking for. 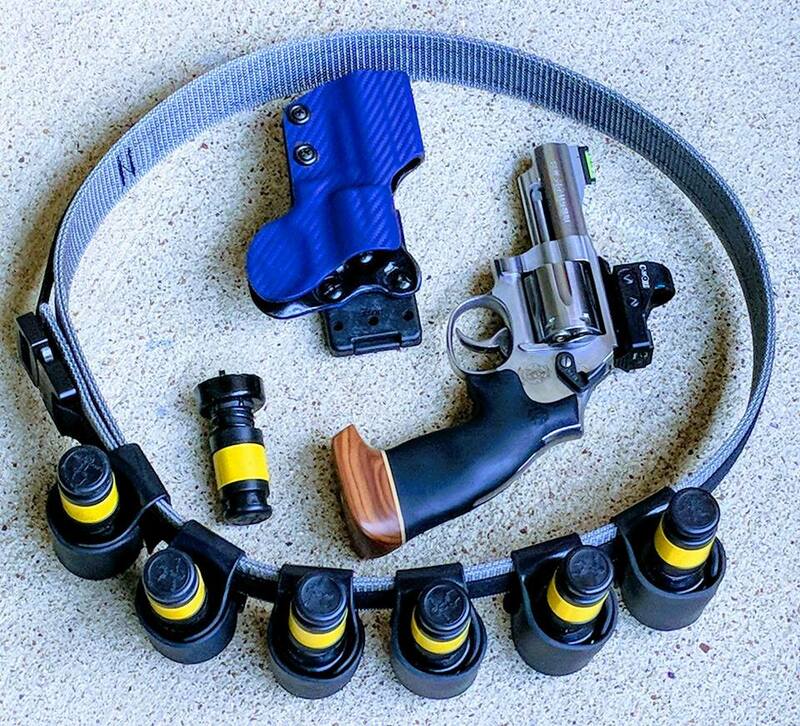 Who is the manufacturer and what’s the model of that holster?